Make sure that web pages work properly. Store your preferences, like language or font size. Find out about the user’s browsing experience. Compile anonymous statistical information, like which pages the user has visited or how long they have spent on the website. Performance cookies: They are used to improve the browsing experience and optimise the functioning of the website, for example, to store service settings or store a purchase in a shopping cart. Geolocation cookies: These cookies are used to find out what country or region the user is in when accessing a website service in order to provide content or services appropriate to your location. Analytical: They collect information on the user’s browsing experience on the website. It is usually anonymous, although on occasions it can also be used to uniquely and unmistakeably identify the user in order to obtain reports on the user’s interest in the services offered by the website. Level 1: Cookies strictly necessary for the provision of the service requested by the user. Level 2: Performance cookies (anonymous) required for content and browsing maintenance. You are only informed of their existence. 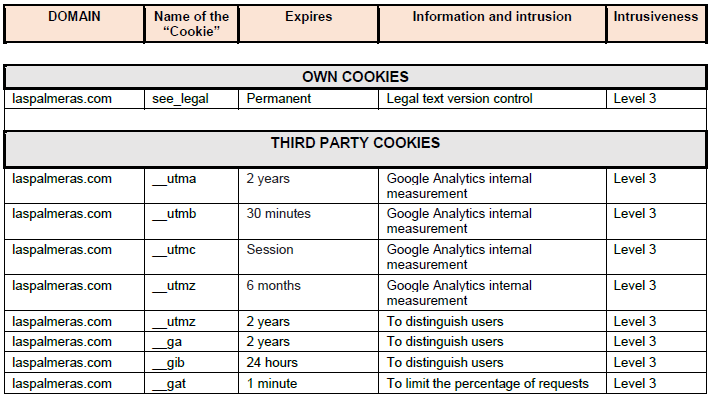 Level 3: Cookies managed by third parties allowing the user to be tracked through other websites that are not the owners of that website. They generally correspond to advertising or analytical cookies which identify the user in a unique and obvious way. We hereby inform you that LAS PALMERAS does not use any “cookies” on its domain, laspalmeras.com, for the treatment of personal data, which would allow private individuals to be identified. Once you have read all the information provided, we hereby inform the user that, if you continue browsing on our website, without having taken the appropriate measures to customise your browsers, to prevent the installation of cookies used by the website, within the terms and conditions set out in Article 22.2 of Law 34/2002 on the Information Society Services and Electronic Commerce, as last amended by Royal Decree 13/2012 of 30 March, transposing directives regarding internal electricity and gas markets and electronic communications, you hereby give your consent to the use of the abovementioned workings.